Along with herbal candies, herbal syrups are among the most favorite herbal preparations of both children and adults. Herbal syrup is a type of preparation which is produced by blending herbal decoctions or herbal infusions with sugar, honey, maple syrup, vegetable glycerin or other type of natural demulcent. It is also possible to use special aromatic agents like essential oils or herbal extracts. It is very easy to give a treatment to a child in the form of herbal syrup. Usually, for making herbal syrups we use blossoms, leaves, stems, roots or sometimes bark of the plants, and the mentioned sweeteners like honey or maple syrup can assist in masking unpleasant or bitter taste of this herbal blend. For making herbal syrups you can use usual kitchenware like saucepan, jugs, pots, as well as wooden spoons for mixing up the syrup. Also, you should prepare necessary number of dark glass bottles (sterilized) in order to place your ready product for storage. Plastic funnels can assist you in transferring your syrup from saucepan to the bottles. There are several most common ways of making herbal syrups. Certainly, the most important step is choosing the herbs and parts of the plants which will compose the main formula of your herbal syrup. The second step includes making herbal infusion or herbal decoction by simmering tender parts of medicinal herbs and plants, or boiling hard parts like bark or stems. This step should be followed by straining and measuring the amount of herbal base for your syrup. 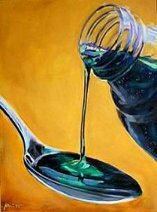 Then, you can add sugar, honey or other demulcent, using a 1:1 or 2:1 ratio to liquid. Place the mixture on fire and stir carefully until sugar or another sweetener you are using is dissolved. It is possible to receive the syrup of a desired density by allowing it to be simmered for the required period of time. Remove the blend from fire and leave it to cool down. Once your syrup is ready, you can add some essential oils like rose or anise, ginger, peppermint and others. And finally, it is the time to place your herbal syrup into dark glass bottles. Use special cork stoppers and do not forget to stick the labels with the date of production.